This entry was posted in Congress, Donald Trump, gun control, Liberals/Democrats/Left, Trump Derangement Syndrome, United States, US Presidents and tagged 15th congressional district, Eric Swalwell, Joe Biggs, Tom Steyer. Bookmark the permalink. It is downright shocking to see all these various nare-do-wells creep out from under their various rocks and attempt to bully their way to the top of the heap of nare-do-wells that are competing from the ranks of Demoncrats to run for POTUS. I was truly happy to read the responses from the various Patriots from the State of California in response to these idiots and their ideas. 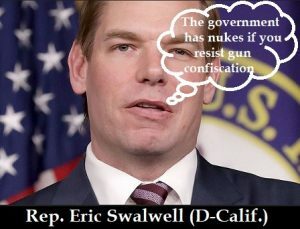 Swalwell is in love with himself. I have never seen him on TV where he didn’t lie out his rear. Then he goes on to swear by it. These comments does my heart good. It would be nice to see the California of 30 years ago. This idiot doesn’t stand a chance of getting elected President. He’s just a tool of the DNC/media to put forth anti-Trump baloney. Makes for good press for the resistance. Nothing more. He’s a clown. He’s just a pretty face that thinks he’s gonna make it on his looks! Sorry boy, no can do! How many in the us military? 4M 6M? 80M+ Americans have some 300 M firearms and maybe 10B rounds of ammo. Plus a good deal of those in the military will refuse to comply with disarmament of the populace. These morons that want to gut the 2ndA will be the first to be dispatched. I say it’s past time to rid ourselves of this scourge. Gve them their walking papers.